Below is a complete list of all the Costa Brava camping sites in Sant Pere Pescador. This part of the Costa Brava coast, in the Bay of Roses, is lined with many large family-oriented holiday camping sites, just south east of the town of Sant Pere Pescador, stretching almost all the way down to Sant Marti d’Empuries near L’Escala. 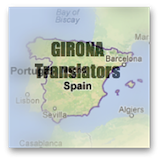 Before you look through the list of Sant Pere Pescador camping sites...please click here to open in a separate window...How The Camping Costa Brava Accommodation Directory Works? Want to see if Sant Pere Pescador beach is the beach for you? Take a look at the pictures of Sant Pere Pescador and sneak a peek at the beach webcam. 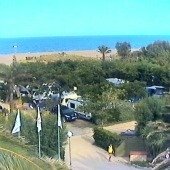 Location: Camping Aquarius is on Sant Pere Pescador beach, about a 15 minute walk from the town of Sant Pere Pescador. Description: There are electric and non-electric pitches. This large Costa Brava camping site has full services for family camping – bar, restaurant, BBQ, supermarket, bar, cafeteria, laundry, showers, car wash, table tennis, beach volleyball, 2 kid’s playing areas, bike hire, children’s entertainment, creche and a games room. Pets are allowed. 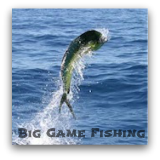 Size: 1180 pitches – a large Costa Brava camping site!! Location: Camping Ballena Alegre Costa Brava is the farthest campsite away from Sant Pere Pescador town, nearer Sant Marti d’Empuries. But when you read what facilities they have you may never feel the need to leave…….ever. Description: Everything – Camping Ballena Alegre Costa Brava has everything! Apart from electric and non-electric pitches and bungalows, it also has - multiple bars/restaurants, many swimming pools to suit different age groups, pub, pizzeria, beach bar, pool bar, ice-cream parlour (come on!! ), supermarket, souveniers, bookstore, pharmacy, laundry, top-notch gym, massage centre, tennis, beach sports, bike rental, internet, kid’s playgrounds, car wash and from mid June to mid September there is a 24hr doctor on site. Pets are allowed (but not in bungalows). Ohh yes…it has a creperie too! Size: 1500+ pitches – a very large Costa Brava camping site!! Location: Found between the Camping Aquarius and Camping Ballena Alegre, Camping Las Dunas enjoys the same convenient location - on the Sant Pere Pescador beach and about 20 minutes walk from Sant Pere Pescador town. Description: There are electric and non-electric pitches, bungalows and mobile homes. Another large Costa Brava camping site with full services for family camping – bar, restaurant, supermarket, bar, 2 swimming pools, kids playground, pool bar, beach bar, pub, disco, internet room & wifi. There is also kid’s entertainment offered as well as flamenco and Spanish music evenings. Pets are allowed (but not in bungalows/mobile homes). Location: Camping La Gaviota is located due east of San Pere Pescador near both the river Fluvia and Sant Pere Pescador beach. Description: There are electric and non-electric pitches, bungalows and mobile homes. 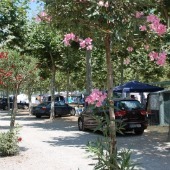 This Costa Brava camping site provides campers with a restaurant, bar, laundry, bike rental, car wash, kid’s playground, swimming pool, supermarket, games room, currency exchange, internet connection, music and flamenco shows. Pets are allowed (but not in bungalows/mobile homes). Location: Sharing a similar location to most of the beach camping sites around Sant Pere Pescador (i.e. on the beach), Camping L’Amfora is in a prime location to enjoy the water sports and local sights of the Alt Emporda. Description: There are electric and non-electric pitches, bungalows, mobile homes and apartments. At this Costa Brava camping site you will find a bar, restaurant, supermarket, laundry, internet room, ATM & currency exchange, tennis courts, volleyball, basketball, mini golf, bike hire, table tennis. There are also 4 swimming pools and if that is not enough, this site has direct access to the beach for the biggest pool of all – the Bay of Roses! Enjoy karaoke, music nights, dancing and the disco too. Pets are allowed (but not in bungalows/mobile homes/apartments). Location: This Costa Brava camping site borders the southern section of the natural park of Aiguamolls de l’Emporda and is approx 5 km to Sant Pere Pescador. It lies directly behind Les Llaunes beach. Description: There are electric and non-electric pitches, pre-assembled tents and bungalows with own bathrooms. 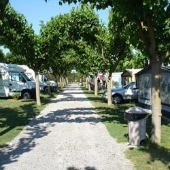 This Costa Brava camping site is open from 14 May to 17 September and provides grass floored, partially shady pitches. Camping Nautic Almata also has several little canals where you can moor private boats! Camping Nautic Almata provides a restaurant, bar, creperie, pizzeria, beach bar/disco, supermarket, boutique, hairdressers, internet/wifi, swimming pool, jacuzzi, children’s paddling pool, aquagym, games room, bicycle hire, horse riding, car wash, children’s entertainment, adult entertainment, watersport school (surfing, windsurfing and dinghy sailing), scuba diving centre, tennis, football, table tennis, mini-golf, boule, beach volleyball and a doctor. Pets are allowed (apart from in pre-assembled tents and bungalows). 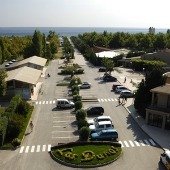 Location: Just before Camping La Gaviota on the same road, Camping Las Palmeras is close to Sant Pere Pescador town, and both the river Fluvia and Sant Pere Pescador beach. 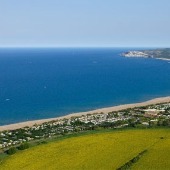 Description: There are electric and non-electric pitches, bungalows, mobile homes and studios. This Costa Brava camping site is reasonably small but provides campers with a swimming pool, wifi, supermarket, restaurant, laundry, kid’s playground, live music on certain weekday evenings, and a gym. Pets are allowed (but not in bungalows/mobile homes/apartments). Location: Camping Riu is the nearest of Sant Pere Pescador’s campsites to the town centre itself. It is located just south across the river Fluvia. About 5 minutes walk into Sant Pere Pescador town and 10 minutes walk to Sant Pescador beach. Description: There are electric and non-electric pitches, bungalows and mobile homes. Camping Riu is a rare Costa Brava camping site indeed – you don’t find many small campsites with big camping facilities. Guests can enjoy a swimming pool, bar-terrace, restaurant, wifi, kid’s playground, supermarket and a gym. This Costa Brava camping site even has it’s own quayside – nice…if you have a boat! For those of us who shy away from the millionnaire’s lifestyle, well, we can hire kayaks here too. Pets are allowed (but not in bungalows/mobile homes).